Spicy and Sweet, Fights and Patch Ups, Arguments and Deals, Pillow Fights and Togetherness, Love and Hatred, Tears and Laughter, a friend for life, a companion forever, this is what all we have in a relationship with our sibling. Yes having a sibling is the best gift we can ask from Lord when it is granted. If he was offered something to eat, he always ask one for me and ate with me. Later this habit of asking for one more transited to bringing that one thing and eating it only after sharing with me. We used to ride bicycles and explored new roads and lanes in our neighborhood. Never to be forgotten days were they. I still remember how he convinced my parents to allow me to for trip in my college days, but made sure i was with good company as well as safe. Though he is younger, day by day he became protective and in his teens he grew up as my elder brother, protecting and safeguarding me all the time. He accompanied me everywhere, while he was bullied for this by his friends, but he never cared about them. He has been biggest support then for me and is still so. He was always present to solve my problems and he became protection shield for all my mistakes. He safeguarded me against parents' wrath when i made mistakes. Though i was elder, he pampered and treated me as his little sister but he always agreed to what i say and followed my orders without questioning back. He trusted me and never doubted my intentions for him. Even if i order him to do anything wrong, he would do it, as he knew that i was present to save him in any adverse situation. He always sensed my motherly love towards him and reciprocated in the same way. At times we fought too much that our parents' had hard time making us talk again. But deep in our hearts we were tied together, it was just our outer anger that was fanned. Once in a summer vacation, it so happened that i wanted to watch "I dream of Jennie" and he wanted to watch "Popeye - The Sailor Man", we fought over remote and in this sequence the remote fell and broke down. My mother was very angry with us and told that she would send either of us to our Nani's place as punishment. We apologized to her and promised that such thing wont be repeated and we both want to go or else none of us will go. Just the thought of leaving each other trembled us and we realised that we cannot live without each other and happily spent rest of summer vacation at Nani's place with our cousins. We have always been winning team. We always fought with each other on petty things but we also fought for each other. Our parents were proud of such unity and bond between us. I remember making him wearing my frock and he doing all sorts of Nakre in front of mirror. It was so much fun to watch my cute brother dressed as me. At times, in innocence, he used to be angry on mum that she dresses me in different outfits and he had to wear same kind of outfits and cried to wear my dresses. I used to hug him and tried to make him laugh in such instances. 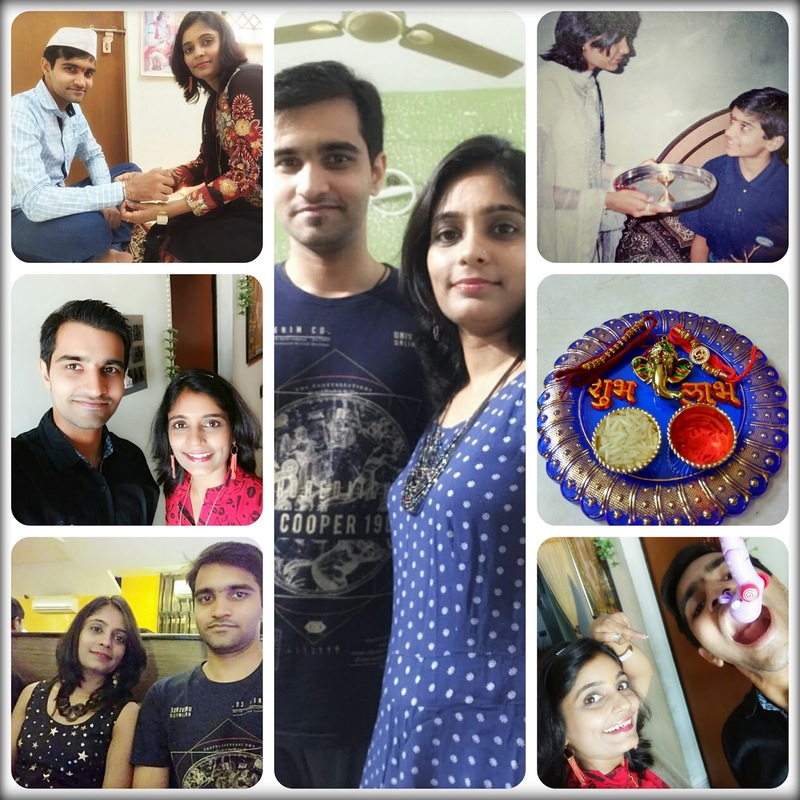 Rakshbandhan was our day in childhood. We used to wait for this day for the whole year. He used to demand biggest rakhi in the market and i always bought his favourite one. This brought big smile on his face. Those days have gone, never to come back again but the memories are still fresh. Now we are busy in our individual lives but never fail to meet and brush up old memories. We are not together on every Rakshabandhan festival but i tie him rakhi when we meet. I know he is a friend whom i can always rely and put my head upon. He is always ready to listen to my silliest of talks and laughs at my poorest jokes. He never judges me instead puts full faith on my words and believe me to be correct, even if whole world is against me. For him, my happiness is priority and he can do anything to bring smile on my face. When hard days of my life were going on, he was standing beside me as strong pillar. He never allowed me to break down and gave me courage to face everything. He took smallest of care of me and made sure i come of crisis and be normal again. He never showed his tears to me, but always wiped off mine. His actions and words were in direction of my benefit. He did not care for anyone when it came to me. He is calm person by nature but for me he can fight against the whole world. I cant explain how lucky i am to have a brother on whom i can counts everything. He has stood for my rights and made me a better person. He has completed me by not finding faults but always correcting them. On this auspicious festival of Rakhshabandhan, i pray all happiness of the world for him and all his dream comes true. I wish he succeeds in whatever he does in his life. I wish him best of health and may he receive everything that he desires and deserves. I cant imagine my life without him. We share a world which is full of love, affection and care for each other. I hope with this Rakhi - a string of love and togetherness, binds us forever and makes our bond stronger every passing day. Love you to the moon and back.